Canvas tarps are made of cotton fabrics treated to be water resistant in order to keep out mildew and rust . In this way, one of these items is much more like a quality sheet or blanket than the plastic poly tarps available. You can get them in a variety of common or custom sizes. They're available in a range of colors and different weights depending on the strength and look you are going for. You might find them in standard or Duck canvas weave. These options make them versatile especially when the goal is to make them blend into their surroundings. Flame retardant tarp coatings are an option for treatment as well. Keep in mind that, depending on the treatment given, the weight of the canvas can change. Regardless, they allow for breathability and trap less heat than other cover options while still protecting your goods from the elements. A longer life is possible with the canvas tarps over other options. This is because they can be retreated after a long time of repeated use. If the coating begins to wear off, you simply reapply and continue to use the product. The canvas tarps are best used for outdoor covers due to their ability to withstand severe weather. 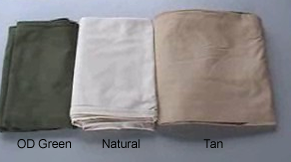 The most common uses of canvas tarps are for vehicles like motorcycles, trucks and boats. The canvas tarps are also used for construction or for covering log piles. This makes custom size opportunities an important benefit since different uses and people will require a number of possible sizes. Canvas tarps are well worth looking into as a potentially more attractive and comfortable option for canopies or tents that the shiny plastic and vinyl tarps. Costs vary depending on the size, treatment and color options. It is possible to order them online from a number of websites that will allow you to choose from the different possibilities.